Has there ever been a time in your life where you’ve thought deeply about ultimate questions? Whether you call it religion, philosophy, metaphysics, or just important life questions, many (not all) people wonder about these things. For some it even gets to the point of worry or fear when they begin to realize that they are human and may be wrong about what they believe. Perhaps it is worry about the afterlife. Or maybe just general worry about not having the correct answers to ultimate life questions. For example, Robert Kuhn, host of Closer to Truth, has said in some of his interviews that the question of whether or not God exists has even tormented him. There were several times in my life that these questions tormented me, but I no longer see any benefit from allowing them to control me. I still have what I like to call a healthy interest in ultimate questions but I don’t let them get to me in the way that they did years ago. Two periods in my life stand out very clearly to me – the first was right before I converted to Christianity, and the other was around the time that I left Christianity. The second period especially was a very dark time for me, sometimes waking up in the middle of the night to a noise fearing that God was about to punish me. Fear is a natural thing and it saves us many times from getting badly hurt or killed, but it can be distorted and used in the wrong ways if it is applied toward “the unknowable” region of ultimate questions. The “parable of the poisoned arrow” has a lot of wisdom in it that I believe we can all learn from. This link explains it even clearer than the video and it’s worth the read. My point is not that we should entirely give up on thinking about and exploring uncertain questions – obviously trying to understand the truth about reality is an important part of life and has the obvious benefits of improving our lives the closer we get to the truth about that reality. That is what scientific, philosophical, and all other fields of investigations are all about. By all means that should continue, but a healthy balance and understanding of uncertainty is also an important part of that process. There isn’t too much I can say to people who don’t believe ultimate questions are elusive, that’s just something that some people begin to realize at some point in their lives, and some people never get there. I’ve shared some of these ideas in the first few posts of my blog – much of it has to do with the realization of our humanity and ability to be wrong, especially as knowledge claims become more and more removed from our sphere of experience and more nebulous (or inscrutable) as far as probability claims might go. But if you have gotten to that point then it should be very clear that worrying about these elusive questions cannot end up being healthy for your life in any way. All that it does is physically stress your mind and your body with no productive purpose or conclusion to help it reach to. In fact in some cases stress can negatively impact our rational decision making process – so in effect allowing these questions to torment you can possibly cause you to form the wrong conclusions about the very questions that you want properly answered. If you want to learn more about the mind, fear, stress, and ways to overcome fear this post by Victoria N℮üґ☼N☮☂℮ṧ is a great place to start. Victoria has a lot of information related to the mind and has studied a great deal on the subject. During that dark period of my life I described before, I searched several different religious traditions, spent a lot of time with several different religious groups, and met weekly with my former pastor to discuss and read many different books related to religious questions. There came a point where I realized that the torment was hurting me more than helping me so I decided after a year or so to take a break. I ended up spending several years very rarely reading or thinking about religion. What is interesting is that instead of that being a dark time in my life, It ended up being filled with light – filled with life, love, friends, family, falling in love, getting married, having children… It was after that long period that I was able to return to a more balanced, healthy, and much more enjoyable exploration of ultimate questions. This entry was posted in Afterlife, Agnostic, Atheist, Epistemology, Meaning, religion, Spirituality and tagged afterlife, agnostic, agnosticism, anxiety, atheism, Atheist, belief, critical thinking, epistemology, fear, religion, torment, uncertainty by Howie. Bookmark the permalink. For anyone to be that worried, tormented even, is indicative of the fear-based indoctrination suffered by millions. No-one can do a darn thing about it so why let such nonsense consume you? Sadly, the indoctrination comes with all the insidious crap foisted on kids who take it through to adulthood: Jesus is watching, I am a sinner, I must/mustn’t do such and such or I’ll go to hell. Religion and especially theism is not only ridiculous, but demeaning as well. It rubbishes human dignity by confirming and celebrating how worthless humans afe unless they have ‘god’. Let just one religious person demonstrate the viability of god-belief and I’ll be in church on Sunday…guaranteed! Great post, Howie. I finally hit this point myself. I realized that as long as I was doing my best to go through life honestly and to treat others kindly, then I probably had nothing to worry about. Even if there is a god, as long as he’s a decent sort, he couldn’t be too disappointed with someone who lived their life in such a way. I also think that if what you say is not true then we are actually all screwed, so no point in worrying about that especially when there doesn’t seem to be good reasons to believe in some kind of scary spiritual realm. Howie, that’s one of my favorite quotes. Thanks Victoria. You’re welcome for the shout out – I thought it was cool how we had posts that related in some way. That video was excellent and related well. It also relates a lot to some of the antagonistic comments that Nate is getting from 2 Christians over on his blog. Mike and Kathy have both insinuated that none of us could have been TRUE Christians because we didn’t search out every little nook and cranny of Christian scholarship in an effort to try and justify the beliefs that did not look correct to us. Of course not only do their very own in depth “solutions” to the issues look very questionable, but the issue addressed in this video remains for them as well. I wonder how much in depth scholarship they have perused in the hundreds of other world-views in order to justify those. Howie, I’ve been following the debate on Nate’s blog. If only they knew how common it is for Christians to say that. I suspect it’s a defense mechanism. Those two seem to have very strong death anxiety and/or some serious deactivation of neural circuitry to the frontal lobes due to their loyalty and love for their god/religion. Kathy is young and appears to have been strongly indoctrinated — especially from political forums, which I frequent. When I read what Kathy writes i feel like I’m reading a teleprompter on Fox News. Mike is, well, Mike. Oy. What a character, lol. Oy vey is right! I haven’t figured out a good way to have a productive conversation with that type of personality. 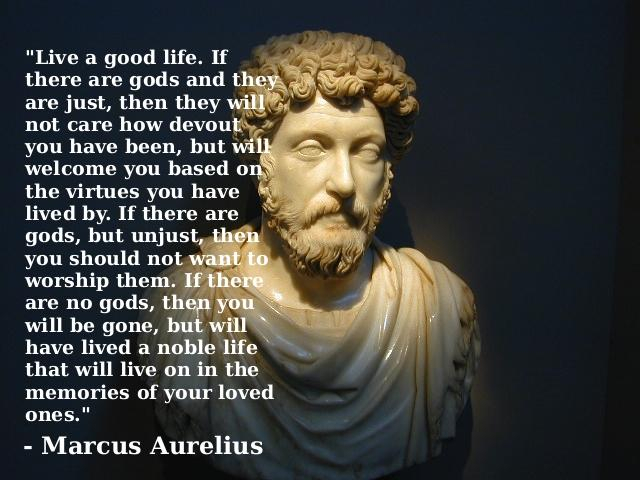 Aurelius is okay, after a fashion, but for true insight this beats old Marcus hands down. “Fear is a natural thing and it saves us many times from getting badly hurt or killed, but it can be distorted and used in the wrong ways if it is applied toward “the unknowable” region of ultimate questions.” Excellent. Thanks TFP! I wrote this piece because ultimate questions have tormented me a few times in my life, and also because given my interactions both online and in real life I know there are others who go through the same kind of difficult periods in their lives. It doesn’t seem like a very common thing, but I think there’s enough people who do have a painful search so I thought it worth sharing my own experiences. What you quoted from my piece is a good summary of the post. Thoughtful, heartfelt post, Howie. I have several times reached painful points in my journey. As you know, I remain a Christian. Embracing my doubts has been a painful road, though. Thanks for sharing part of your journey. Thanks a lot Josh! I’ve always appreciated the perspective you’ve added over on Nate’s blog and I’m glad you’ve stopped on over here. I’ve only written pieces of my entire spiritual journey on my blog. I just realized that I did not link to the most significant portion in this blog post. You can read that here if you have the time. Embracing doubt has been an incredibly difficult thing for me so I can very much relate Josh. I hope your road becomes easier as you continue. You’re welcome Ryan, and glad you stopped by! Ya know, when I wrote this piece I thought it might apply and be helpful to people of any religion or belief who struggle with doubts and questions, but I was a bit skeptical that any believers would really end up getting anything out of it. I’m glad that it sounds like both you and Josh may have gotten something positive out of it. A lot of times people have a hard time being inspired by those who are not inside their own “camp”, but I don’t see why that has to be. Just look at this post itself as an example – I also was able to be inspired by a Buddhist even though that is not my religion. In fact if you go to the Closer to Truth website and find the original interview of the guy in the video (Guruge), he says a lot of things in there that don’t match up with my beliefs at all, but this short section of the interview that I clipped ended up impacting me quite a bit. I found out that self imposed torment and ruminations is never very productive 🙂 if we decide to follow a faith, then we can follow and trust. But all self torment does is waste time…. I have often been tormented by the question, “What is the good life” or “How should I live”. My wife often accuses me of being the consummate Boy Scout — indeed, I was an Eagle Scout. I embraced Christianity exactly because I felt it was the best choice for the good life — not because I cared at all about Eternal Life, nor about the existence of a God, but about living a good life. It was not until seeing other faiths and religion-free people doing the same that I later deconverted. But unlike you, Howie, I never experienced the fear of God or the fear of damnation — fortunately, I was not raised with those ideas. But similarly to you, Howie, we are both focused on the good (as you say in your last paragraph) and not the fears the groups teach of to have concerning outsiders (religious, political or others). I agree Ryan – can’t say I always live by that, but I do try. It’s probably some combination of nature/nurture, but the unproductive ruminations do seem to be more prevalent in some. Just looking at my parents, brother, as well as my children, some don’t seem to fight with it at all (actually, just looking at my children tells me there very likely is some genetics involved). That’s some really good input Sabio. Funny thing is that I was raised Jewish, our brand of which was also completely devoid of any talk of afterlife. In fact right before I converted to Christianity my mother was surprised when I told her that the book of Daniel talked about afterlife. It was the influence of my friends (one in particular) which brought up the thoughts of what may come after death. With my tendency for being affected by fear of the unknown it ended up being admittedly the primary factor in my conversion. If there was some way of finding out if there is a “God” or “Way” of goodness then I still would want to follow along even without the fear. I’m pretty sure I understand your views of “goodness” (from some of your posts both on your blog and Nate’s), and I think I may actually lean in that direction, so that does kind of throw a bit of a wrench into that idea. I think we can often understand much more useful knowledge by understanding this principle than by winning a winner-take-all logic knock-down type of fight. You demonstrate this well. I like that video, but it does have its problems. I like board games, but in a qualified way. Like religions, there are tons of board game too many to explore in detail and even begin to get competent at. But I can start to see related principles between games and quickly dismiss games I have no interest in by those principles without even exploring deeply. For example, I am not fond of luck in games, so I can see what level of skill is involved and decide if I like it or not. I also (personally) do not enjoy games where memory plays a big role. So with those two criteria, I can already ignore a huge number of games without wasting time on them. If we look at religions this way, we may find that understanding their common principles will help us in understanding the phenomena of religion, help us not waste time exploring similar religions once we have decided on a few principles, yet it may also show us principles we agree on or religions which minimize those things we disagree with most. Such a venture, IMHO, may be indeed valuable for some types of peoples. I think we can often understand much more useful knowledge by understanding this principle than by winning a winner-take-all logic knock-down type of fight. This is a very interesting point I’ve been thinking about since you wrote it. Understanding the things (temperaments, biases and such) about ourselves that drive us does play a very important role in our pursuit of knowledge. And while I don’t particularly enjoy them, debates in all different fields obviously play an important role as well – and while sometimes these look like “winner takes all” outcomes, I would think a lot of times the one who looks like a winner is not always the one on the side of truth, and probably very often the truth is mixed between the ideas of everyone involved in the debate. Sabio – regarding the video I think you’ve added an excellent caveat to it. I agree very much and it is why I continue trying to learn about many different worldviews instead of kind of “giving up” as the end of the video seemed to kind of imply. However, what did strike as a useful point in the video was in regards to the very common technique of apologists to suggest that after coming across several issues within Christianity non-believers did not delve deep enough into all of the extreme details of the back and forth debate, and that if we had done that then we would be believers. The problem here though is that they do not give all other faiths the same chance at resolution – I am doubtful that they go and seek out the very best scholars among other faiths and delve very deep into the extreme details of the back and forth debate to see if those other faiths can be “redeemed”. Nobody would have that kind of time. I absolutely agree with both your above comments! Nice post. Reading through it and the comments makes me shake my head a little. Not at you or any of the commentators but at the realization that fear leads to death. Physical, mental and emotional death. I am very happy that you seem to have worked your way to a healthier place. Life is for the living so enjoy it. I appreciate your input, and thanks for the follow. By the way, due to time I’ve been skipping a whole lot of the comments in Nate’s “Kathy” series (she’s famous! ), but I’ve made it a point to read all of yours. I don’t know how you do it, but you’re able to nicely add sarcasm in a way that looks like it’s all in fun rather than being derisive (assuming I’m reading it right 😉 ). It’s refreshing to see a unique point of view out there, and a more healthy one that’s not based on fear. I wish it was easier to get that sense from reading the bible and scriptures of other religions. I like your heartfelt and honest posts about religion. These torments you speak of came to me when I was a little girl lying awake at night wondering why adults were constantly lying to me about Bible stories, why they couldn’t explain anything clearly, why they didn’t seem to know what they were talking about even though they acted like they did. Then dutifully reciting a prayer and ending with “in Jesus name”. A sort of Pascal’s wager, even though I didn’t know what that was at the time. Of course, that was my childish mind and their lack of education. Truly religious people would not do and say the things they did and said to me. I could only relate to Aesop’s fables when I was a kid. That’s what kids should be given to read, not gory illustrated children’s bibles depicting gross injustices with metaphors that go over their heads. There is some truth to what you say…these moments of torment can be very very unhealthy indeed. On the other hand, they don’t come to everyone—a great number of people don’t feel the need to think about God until they’re on their death beds. I see those troubled years from childhood through college as a gift. As the reason I felt compelled to study philosophy, as the reason I am who I am. Of course, I’m really happy it’s in the past. Hi Tina – Thanks for the positive feedback! “I see those troubled years from childhood through college as a gift. As the reason I felt compelled to study philosophy, as the reason I am who I am.” – I can relate to that quite a bit. I’m glad you’ve made it through all that in a positive way. And you are right – the bible really isn’t a very good children’s book. Thank you for sharing this parable. Also I enjoyed reading the excellent comments. They reflect allot of my own feelings toward the matter. Sometimes it seems to me that both Christians and Atheists can act like the poisoned man. I have talked to Christians who get get hung up on origins and then set up the view that if this or that in the bible didn’t literally happen then the whole religion is worthless. It seems that many of these Christians become atheists. But whether they are Christians or atheists they are still making the same mistake. They are erecting a burden of proof that requires impossible certainty. They think that if their demand for certainty is not met then that would justify a far broader rejection than is warranted. I found it odd that at the end the person decided to be an atheist. Also although I agree that each path lacks certainty this person in the video claims that all paths are equally uncertain. That is a very different claim. Everyone makes choices about how they will live their life. It seems to me that the atheist says they do not have the proof they demand that God exists. But then there is still the pragmatic question of how they will live their life. And occasionally when you answer that latter question you may find your answer is different if there is a God than if there is not. It might also be different if there is a real morality (with or without God). So yes there is minutia that seems to have no impact on what we should do. But I think there are some big questions that do have bearing on how we should act. I’m glad you liked the parable Joe. You make some good points about people who tend to only see black and white. Finding the correct balance between completely credulous and completely incredulous is an important thing, but like most balancing acts it’s easier said than done.